A rosé outlook for the New Year. For Vinoland's annual New Year's Eve bubbly tasting I chose two rosé wines - one French, one domestic. Both wines are remarkably similiar to look at, with their deep salmon hue, but quite different on the palate. The Mumm Brut Rosé is, as always, delightfully pleasant and approachable with subtle black cherries and strawberries and, thankfully, only 15% Chardonnay content. The Cuveé Rose Laurent Perrier has always been one of my top three favoutire Champagnes, and his bottle did not fail to disappoint my palate. Made with 100% Pinot noir this elegant red-berry, subtle rosy-vanilla, lean citrusy-mineral wine, in it's distinctively shaped bottle, is simply sublime. And that's all I'm going to say on the matter - I'm wasting valuable drinking time. ...I got a little bit fed up with wine and decided to have a Christmas beer instead. Anchor Brewing Company's Christmas Ale is something I look forward to each year - if I can find it. This Christmas Ale is a limited production and is only available during a specific period: early November through mid January. But honestly, I have never seen it in the shops for that amount of time. I buy it as soon as I see it because it sells out fast. With a different, tree-adorned label every year this ale is medium bodied, quite dark, pleasantly spicy and altogether delightful. Throughout the year I often imbibe in an Anchor Steam Beer, or sometimes a bottle or two of their Porter, but it's the release of this San Franciscan brewery's Christmas offering that I eagerly await every autumn. My purple, polka-dotted glass just adds to the festivities. Yuletide greetings from the Napa Valley. I'm wishing everyone, who visits Vinsanity, a very festive Christmas. I hope you are all surrounded by the foods, wines, poochies, friends and family members who make you the happiest. A little bit of home. The smell of baking mince pies today transported me back to the Yuletides of my childhood. Classic, home-cooked Christmas goodness, helped along by James Robertson's mincemeat - the last jar in my local supermarket. I could have been in my mother's kitchen. Wishing the simple joys of Christmas to you all. I love cheese, and when confronted with this veritable wall of blue cheese at the Oxbow Public Market today, whilst cheese-shopping with Vinomaker, I nearly passed out with excitement. The Oxbow Cheese Merchant's selection of coagulated milk products may not be the most extensive I have seen, but it is nonetheless impressive - and the staff are very attentive and knowledgeable. As I stood salivating over the Colston Bassett Stilton, the resident cheese-monger (why wasn't cheese-mongering a career choice offered when I was in school?) interrupted my reverie to point out Stichelton Dairy's blue cheese made from unpasteurised milk. Hadn't had it before, had to have it now! Other cheeses selected included one called Challerhocker chosen by Vinomaker (which means, perhaps appropriately for a winemaker, 'sitting in the cellar' - which he does on occasion), and I couldn't leave The Oxbow without a cheese called St. Foin which promises to be irresistible when paired with Champagne. We'll see. Jacob Marley better not get between me and any crumb of cheese, otherwise he may end up looking like "an undigested bit of beef." I usually take the photographs for my Winery Christmas Lights (WCL) series after dark to showcase the Christmas lights in all of their glistering glory. Unfortunately, the Christmas trees at Darioush Winery, on the Silverado trail, are behind locked gates at night and thus inaccessible to me and my camera (unless I have a telephoto lens). So, this week I decided to revisit a previous WCL to get up close and personal, so to speak, with the winery's decorations. The architectural style of Darioush is not one of my favourites in the valley, I have to say. Designing a winery building in California to look like a temple in Persepolis (in ancient Persia) works I suppose if you are Iranian, and proprietor Darioush Khaledi is indeed Iranian. Khaledi grew up in Shiraz, (yes, it has been suggested that that is where the actual grape of the same name originated), apparently fell in love with wine at an early age, became rich, started a winery, etc. Darioush specialises in Bordeaux varietal wines, but they do make a very nice Viognier also. But, back to the lights. Darioush has four Christmas trees, bedecked with garlands made from large leaves (Magnolia fraseri perhaps), some a natural dried brown and some sprayed totally silver. Three of the trees have blue lights and one has white (the lights in previous years have all been blue). Blue lights always look a bit cold and austere to me, and somehow leave me feeling a little well, blue. Something more red, green and sparkly is more in order if I am to be completely honest, but I am appreciative that this winery made any effort at all. On this, the occasion of the winter solstice, I decided to take a quick walk around the vineyard with the Vinodogs. Although we have had little rain, we have had quite a windy autumn and all the grapevines are now stripped of their leaves. To my surprise, I found a skeletonised bunch of Red Globe table grapes that I obviously missed when picking the rest. It looks like wasps have had their evil way with this bunch of grapes, but I'm hoping some birds have also found this a tasty little treat. I learned, this past growing season, that the Red Globe grapes are rather immune to infection by powdery mildew...on the other hand Crimson Seedless and July Muscat are extremely susceptible to infection...hence the lack of those two varieties of grapes on my table this year! We are having lovely weather right now; cold frosty mornings, with some foggy ones like this morning, and wonderfully sunny afternoons with temperatures in the low 60s. And there is no rain forecast through Christmas. The weather has been altogether unseasonably mild and may, in part, be responsible for the early appearance of mustard in several vineyards (same vineyard as here) around the valley. It seems really early this year, but then again I say that every year! 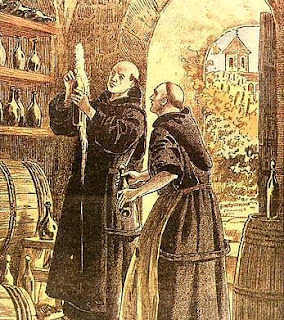 For my latest True Wine Lover, I have decided to showcase the nifty work of Dom Pérignon, a Benedictine monk, oft credited with the discovery of the sparkling wine production technique known today as méthode champenoise. Dom Pierre Pérignon arrived at the abbey of Hautvilliers in 1668 at the age of 30. He immediately showed a great acumen for winemaking and soon became the maître de chai. Father Pérignon did not exactly invent Champagne, in fact he believed that secondary fermentation (which creates the bubbles that I love), was in actual fact a fault and referred to the resulting wine as "vin de diable". I bet the old, tonsured monk was none too fond of the exploding bottles either - it's always better to have a full head of hair when there are exploding bottles around. Yikes! It is an Englishman, one Christopher Merrett, who actually holds the distinction of being the first to document the deliberate addition of sugar to wine to precipitate secondary fermentation - when the fizz happens - and then continued to refine the technique. Furthermore, Merrett was a keen metallurgist and is accredited with inventing the thicker glass needed to prevent winemaking's most dangerous occupational hazard. However, Dom Pérignon did pioneer a number of innovations in the production not only of Champagne, but of still wines also. It is said that he was amongst one of the first advocates of natural and organic winemaking. Pérignon was also a skilled grape grower and was adept at blending small lots of grapes before fermentation. Moët et Chandon's Dom Pérignon bubbly is certainly not the greatest Champagne; and the supposed Pierre Pérignon quote, "Come quickly, I am drinking the stars!" turns out merely to be an early marketing slogan. But still, you have to raise your glass and toast an old monk whose name, to this day, is synonymous with good times, celebrations and festivities. A new dawn for Coombsville. This picture, taken last summer, shows sunrise in the quiet south-east corner of the Napa Valley that I call home. As of this past Wednesday, December 14th 2011, I now live in the Napa Valley's newest American Viticultural Area (AVA). Or, in this case, Antarctic Viticultural Area as Vinomaker likes to refer to our little piece of Coombsville, (not so affectionately known to him as The Tundra). The US Department of the Treasury's Alcohol and Tobacco Tax and Trade Bureau conferred upon Coombsville the honour of appellation status, making it the valley's 16th AVA. The petition, co-authored by vintners Tom Farella and Brad Kitson, took a little over 2 years to be approved by the federal government (your tax dollars at work). So to celebrate Vinomaker and I are going to imbibe in a little something from a Coombsville winery, a 2008 Black Cat Vineyard Syrah, and toast our good fortune in having Vinoland recognised by Uncle Sam. Now, let's see what this does to land and grape prices! I may be a little tardy, but I didn't want this week to end without acknowledging the arrival of a little angel who deigned to grace us with her presence. On Monday, Jeremy (aka Do Bianchi) and Tracie Parzen became the proud parents of the gorgeous Georgia Ann. So, please join me in raising a glass of something sparkling (in this case, appropriately, a yummy Mumm) to congratulate Mr & Mrs Do Bianchi on a job well done. I hope Georgia enjoys her first Christmas...and Hanukkah. Tonight was my last night of school. My semester of photography classes is at an end and I can now relax on Monday and Wednesday evenings with Vinomaker and the Vinodogs. I don't know if I will take the advanced level class, starting in January, as I am running out of ideas for photographs. Aside from learning photographic techniques and darkroom protocols, I also learned that to be a good photographer you have to have a vivid imagination - and sadly I'm a little lacking in that department. Ho hum! Never mind, Christmas is enough to keep my small brain occupied for the time being. Once again, it's Gaudete Sunday. And, once again I'm indulging in something pink (but this year, Italian) to pair with dinner. I'm also rejoicing at the fact that I got my tree up and decorated. Phew! The 2009 Tenuta Guado Al Tasso Bolgheri Scalabrone Rosato is a delightful wine. It's a rather fleshy rosé, extremely fruity (dried cranberry and plum), deeply pink, well balanced, with a surprisingly long finish. I love Italian wines. If I wasn't Liverpool-Catholic I think I'd like to be Italian-Catholic...better wine. I'm just sayin'! All too often Christmas can become a blur of glossy tinsel, twinkling lights, and unrestrained consumerism. How often can we say that we relaxed and simply enjoyed the spirit of the season? As I get older, I am increasingly aware of the fact that the memories of quality time spent with loved ones and friends are the greatest gifts I receive each Yuletide. This evening, Vinomaker and I enjoyed the company of my co-workers and friends at Brix in Yountville. 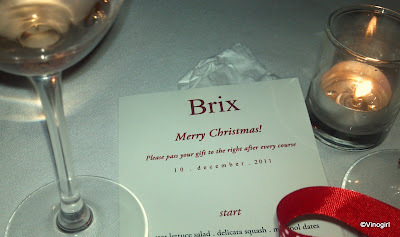 Good company, good food, good wine (and a fun mealtime game of passing a novelty gift to your table-mate on the right after each course), were shared by one and all. This bricks and mortar restaurant, that at any other time of the year is merely a place to grab a bite to eat, tonight became not just a building but the physical embodiment of the Christmas spirit. A good time was had by all. Merry Christmas to all my co-workers! Whoo hoo! Several frosty mornings in a row. A Christmas parcel today from Blighty. O Come All Ye Faithful playing in the background. A nice glass of Mi Sueno Syrah next to my laptop. The Vinodogs slumbering in front of a log fire. If I didn't already know that I enjoy a glass of Soave every now and again, it certainly could be helpful, to aid in my choice of purchasing this wine, to know that this bottle's content was dry and crisp. That it has 12% alcohol by volume - again, somewhat helpful. Vegetarian - important to some people, not me (I'm assuming the producer uses bentonite only when fining). UK units - at this point I'd have to pull out my calculator to figure out the recommended daily allowance for myself (only if I was drinking this in the UK, that is). I have to say, there is quite a bit of potentially useful information crammed onto the back label of this Soave Classico offering from Tesco. However, the universal prohibition sign, which I am assuming warns of the dangers of consuming alcohol whilst pregnant, merely looks like getting pregnant is disallowed. Consumer nannyism at its best. The bottle is glass - good to know. I could not stand them any longer: I had to do something about the swarms of fruit flies that were orbiting my noggin as I tried to enjoy a chilled glass of Sauvignon blanc with dinner last night. Where do these beastly flies come from? Fermentation is well and truly over and there's not even a piece of rotten fruit lurking at the bottom of our fruit bowl. One day Vinoland seemed relatively Drosophila melanogaster free, the next - veritable mobs of those little bête noires everywhere (although they're not black). Of course, it has been unseasonably warm these past few days. It seemed I had only one recourse, to promptly make a fruit fly trap. And, as soon as I had finished breakfast this morning I was on it. Within a short few hours, my cling film-topped plastic cup, baited with a premium Napa Cabernet sauvignon, contains at least six dozen trapped, dying and dead fruit flies (there are worse ways to pop one's clogs). Seriously, where are these things coming from? Like a fine Swiss timepiece, the Far Niente vineyard crew have been out and about these past two days pre-pruning their Chardonnay vines. Once again, this post-harvest operation has been performed in this particular vineyard with precision timing. Vinoland's vines, as I have mentioned on this blog once or twice, are head-trained and cane (and spur) pruned so I don't perform any pre-pruning. Besides, I'm not exactly a planner-type person (am I, Vinomaker? ), so if I get started pruning approximately sometime in February that's planning enough for me! However, I did exercise some forethought this past week and purposely went out and found myself an Advent calendar in anticipation of today, December 1st. It's all about priorities really, isn't it? Don't let the grass grow under your feet. I didn't: I let the grass grow on top of my boots. After a whole summer of seeds apparently collecting in amongst the laces of my trusty Timberlands, it only took one rain event, followed by sunshine, to bring forth a small crop of miscellaneous vegetation. These old vineyard boots were destined to be retired anyway (I don't normally leave my boots outside), so there is no pressing need for me to mow my impromptu, mobile cover crop. The same opportunistic weeds take advantage of the first available moisture every year. It's just that this is the first time I have seen it happen on an article of footwear. The selection of wines for Vinoland's Thanksgiving festivities. A 2005 Mumm Napa Devaux Ranch (available only at the winery), a 2007 and 2008 Herrera Selección Esmeralda Russian River Pinot noir, and a 2006 Truchard Botrytis Roussanne (brilliant with pumpkin pie). I wish everyone a healthy and happy Thanksgiving. This is the last in my mini-series of posts about autumn colours. There aren't too many deciduous trees in these neck of the woods, evergreens are much more abundant. However, the dozens of American Sycamore (Platanus occidentalis) that line the north side of the Oakville Crossroad are a reminder to me, as I drive to TWWIAGE on a cool, grey autumnal day, that even in California the seasons do indeed change. I had to wander around in the Cabernet vines for a while, with the Vinodogs in tow, before I found a red leaf amongst the canopy to photograph. I actually found three, all obscured by their surrounding yellowing leaves, but this one was the most red. The reds, oranges, and yellows we see in autumn foliage are due to a group of natural chemical/phenolic compounds called anthocyanins, carotenoids, and xanthophylls respectively. The red, with which this post is mainly concerned, comes from the pigment found in anthocyanins. Anthocyanins are valuable to plants giving fruit shades of red, purple and blue (cyan, like one of the ink cartridges we periodically replace in our inkjet printers). Anthocyanins also provide photoprotection for plants whilst attracting pollinating insects (not necessary for grapevines of course), birds and other grape-munching creatures that can aid in the dispersal of seed. And, of course, it’s anthocyanins we see in all their glory each autumn as the leaves on deciduous trees change colour before dropping. The thing with grapevines, though, is that it is the grapes that are supposed to change colour, not the leaves. Grape clusters begin to change colour with the onset of veraison with red varieties deepening to their characteristic purple. The grapes are also undergoing other complex changes that are not visible to the eye, but that result in an accumulation of sugars and other desirable compounds prized by winemakers and wine-imbibers alike. The anthocyanin content in a wine ranges from zero in a variety devoid of skin pigment (e.g. 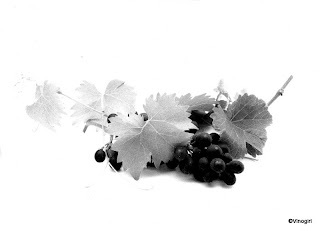 Pinot blanc versus Pinot noir), to a maximum of about 2,500 to 3,000 mg/kg in a teinturier variety, such as Alicante Bouschet. In a good glass of Cabernet sauvignon, like a glass of wine from the vine in the above photograph, one could expect an anthocyanin content of about 890 mg/kg. I am not a chemist, so I am not going to get into how the pigment in grape juice is influenced by acidity, pH, tannin, flavones, co-pigments, iron and other metals - not to mention a dozen environmental factors. The main anthocyanin (not to be confused with anthocyanidins, their dietetic counterparts) in most V. vinifera varieties is malvidin-3-monoglucoside. I know, it's hard for me to pronounce too. But, unless you are a winemaker, the actual knowledge that anthocyanins are anthocyanidins that have been modified by the attachment of a molecule of glucose matters little. What matters most to the average wine-lover is the beautiful purple-blue hue that one espies in the miniscus of the young wine about to be consumed from one's glass. So, raise a glass of a little something luxuriously red (a squid ink black Petite sirah, perhaps?) and join me in a toast to the attributes of the not-so-lowly anthocyanin. Long before viral became a marketing buzzword to describe how thoughts, information and trends move into and through a human population, the Napa Valley's grapevines were going viral without any help from social media. The are many viruses that cause diseases in grapevines, and due to the woody nature of much grapevine tissue, it is often difficult to purify such tissue. New vineyards planted from infected cuttings or budwood will be diseased from the time they are established. That is why a programme such as the Foundation Plant Services (FPS) at UC Davis is so vital to the wine industry. FPS is a self-supporting service department in the College of Agricultural & Environmental Sciences and is very instrumental in the detection and elimination (using heat treatment techniques) of grapevine diseases. Grapevine leafroll is probably the most wide-spread virus disease of grapevines and there are currently 9 different viruses associated with leafroll. Leafroll spreads slowly from vine to vine and impacts both vine health and grape quality, in some instances reducing yields as much as 50 percent or even more, depending on the severity of infection. Typical leaf symptoms include reddening of the leaves between major veins in red varieties. Thus, we can assume that the vivid dark red of the vine in the above photograph, and the reddening of its neighbouring vines on the Silverado Trail, indicates that it is indeed a red variety. A green leaf is green because of the presence of a pigment known as chlorophyll. When chlorophyll is abundant in the leaf's cells, as they are during the growing season, the chlorophyll's green colour dominates and masks the colours of any other pigments that may be present in the leaf. Consequently, the leaves of summer are characteristically green, but in the autumn and at harvest time the entire vine takes on a reddish cast. It's very pretty, but it's very unhealthy. When a virus is present it disrupts the normal physiological function of the vine's cells. A healthy vine will efficiently remove pigments leaving the dying leaf to become yellow, then brown, followed by the detachment of the petiole from the shoot and leaf drop. The red pigment in the leaf, anthocyanin, is usually the most difficult pigment to remove when the vine's phloem has been compromised by a virus. Exactly how leafroll affects the anthocyanin pathway through the vine's vascular system remains a mystery and is the subject of ongoing research. Curiously, a way of checking if a particular vine is infected with leafroll virus is to graft a bud from the suspect vine onto a healthy Cabernet franc vine. This vinifera cultivar is very sensitive to the disease, showing strong symptoms sometimes within as little as 18 months of grafting. Because leafroll virus does not kill vines, but instead causes reductions in yield, maturity and quality, infected vines are rarely removed from otherwise healthy and productive vineyards. The only effective control of leafroll, or any other grape virus disease, is to ensure that healthy propagating material from virus-tested stock is used to plant vineyards. Red coloured foliage, although the result of disease in a vine, really is very attractive. I, along with the valley's tourists, really enjoy the show. Do not worry, nobody was harmed in the making of this photograph - especially me! However, these poor, old vines definitely took a beating. I spotted these vines being pulled out last night on the way home from work. This morning, camera in hand, I was fortunate enough to actually get a photograph of the bulldozer operator pushing the old vines into huge piles. By the time I left work this afternoon all the vines were piled high into 6 or 7 gigantic, tangled mountains of vegetation and steel vineyard trellising stakes - which will ultimately become funeral pyres. With harvest 2011 well and truly over (and believe me, there has been a resounding, collective sigh of relief heard throughout the entire valley), it is now time to plan for future harvests and replanting old vineyards is often on the agenda. Please, raise a glass of wine and join me in a toast to all the courageous men and woman of the armed forces who perished in wars gone by. Furthermore, let us not forget those who, still to this day, are prepared to perhaps make the ultimate sacrifice of their own lives so that the rest of us may live in freedom. It's not everyday that you get to have a $600 bottle of wine with lunch, and for me lunch this past Monday was no exception. It was Vinomaker who shared a bottle of 2007 Domaine de la Romanée-Conti Échézeaux during a business lunch at Celadon in downtown Napa. Vinomaker, altruistically, took time away from his busy day job to help facilitate the smooth installation of a new Chief Financial Officer at a winery that he regularly works with. What a sacrifice! I have always been a firm believer in the maxim that states that the best expensive wine that one might enjoy is the expensive bottle of wine that one didn't pay for oneself (of course, I just made that up). Yet, Vinomaker, not known for being much of a Francophile, was left relatively unimpressed by the contents of this expensive bottle of DRC. The two of us are not huge Pinot noir fans on the best of days, but I was at least curious as to how this wine tasted. I am not ashamed to admit that I pulled the cork from the empty bottle, that Vinomaker had teasingly brought home, and poured the 3-4 ml of wine, that had collected around the punt, onto my tongue. The wine was definitely Pinot-like, surprisingly very spicy, quite oaky (I'm sure due to this wine's obvious youthfulness), but showed great acidity and balance. I gleaned all this from mere dregs, so I'm thinking a whole glass of this very expressive wine must've been quite a treat. Instead, the reality is that Vinomaker went to lunch...and all I got was this lousy bottle! I ain't got no body! Thankfully, this Sauvignon blanc from TWWIAGE has plenty of body to spare. "From ghoulies and ghosties and long-leggedy beasties. And things that go bump in the night." Yes, it's almost Halloween and I'm quite enjoying all the festive goings-on, including the harvest party at TWWIAGE last night. Good food, good wine, and good friends were all featured in bountiful amounts. Thankfully, the Moselland 2009 Zeller Schwarze Katz was not on the wine list. To the superstitious out there, people who think that black cats are generally bad luck, I am here to reinforce your worst fears: do not let this black cat cross your path...or rather, your lips. Black Cat Riesling, sweet and scary, just like Halloween itself. I have been busy all week dropping dodgy looking Cabernet sauvignon grapes and removing leaves in the fruit zone to facilitate a headache free harvest. Prepping for harvest takes a bit of time, but it makes the actual picking of the crop go so much easier. In the course of stripping leaves from the bottom 8-10 inches of each shoot I came across this bird's nest, most likely that of a California Towhee. Vinoland's Cabernet sauvignon is now cooling its heels as it waits patiently to be inoculated sometime tomorrow. Vinomaker and I survived another harvest. Whoo hoo! Harvest 2011...hmmph! Even the large, commercial wineries in the Napa Valley are having a bit of a struggle with mould this vintage. Cabernet sauvignon is quite susceptible to quite a few fungi most notably Botrytis cinerea however, the fruit in the above photograph is showing a rather vigorous crop of penicillium. Scary, they're large enough to cast their own shadows. Fungi lack chlorophyll and need to live on other organisms to obtain nourishment, they are parasitic. Fungal diseases are known as 'secondary invaders' because they thrive on grapes that have been damaged by birds and bees, or grapes that have already had their overall health compromised by diseases such as powdery mildew (Uncinula necator). Wet weather, in the run up to harvest, often causes the worst cases of infection on already injured grapes, so because of the early fall rains 2011 may be a bumper year for fungi. Photograph courtesy of the Marketing Queen. Concrete tanks as fermentors and aging vessels are not a totally unheard of trend in Napa winemaking, so I am not reporting anything new. However, it was only until this past week that I was able to get up close and personal to a clutch of 150 gallon egg shaped tanks at a local custom crush facility. The Romans, some 2000 years ago, used concrete platforms on which to process grapes for winemaking and may have even used concrete tanks for fermenting wine. Clever chaps those Romans - look how they perfected the use of concrete for the unreinforced, coffered concrete dome of the Pantheon in Rome - just brilliant. To this day, there are wineries in the Napa Valley that have never used anything but concrete fermentors: just visit Mayacamas Vineyards during harvest to see their large concrete tanks in action. Up until fairly recently, the majority of concrete tanks being used in the US were produced in France, Burgundy to be exact. Now, however, a California manufacturer using innovative technology has designed a superior egg with an improved concrete composition. Sonoma Cast Stone, a concrete company located in that other valley (in the town of Petaluma, coincidentally once known as the Egg Capital of the World), has true to American ingenuity, engineered a nifty new take on the egg. Any interested party can purchase an egg in one of eight designer colours. How Californian is that? The outfit has even added a pomace port for ease of cleaning which was a major complaint about the French-made eggs. The pros and cons of fermenting in concrete? On the pro side; low temperature fermentations, elevated fruit notes, richer aromatics, and breathability. On the con side; excess aeration (breathability, anyone? ), sanitation, and the possibility of contamination from spoilage microbes e.g. Brettanomyces. Perhaps laughably, a Monsieur Marc Nomblat, of the French firm ETS Nomblat SAS, has been quoted as saying "nobody had Brett problems with our concrete tanks." Titter, titter! Vinomaker and I have not yet tried a wine that has been produced in a concrete fermentor, so we have no personal experience with the end result, although Chronic Cellars 2010 Stone Fox is on my radar. To ferment in cement? That is the question. This cute, little alien-like egg recently showed up at the winery where I am gainfully employed (henceforth to be known only as TWWIAGE). This egg is perhaps the most appealing piece of promotional material I have ever seen: it is certainly more engaging than the Boswell Company's French oak toothpicks. The hawkers of this little, elliptical wonder are onto something. I'd buy one! A growing trend, it seems, is for winemakers to use the aforementioned eggs, or concrete tanks of various dimensions, as an alternative to stainless steel. I cannot see TWWIAGE switching from stainless steel, (when 85% of our white wines are barrel fermented and sur lie aged), to cement anytime soon - the approach to winemaking at TWWIAGE is rather traditional. The soil is not white in Oakville, these mounds are large piles of fertiliser heaped around the edge of the Opus One vineyard waiting to be applied and disked in. Whilst vineyard managers are primarily concerned with all things harvest at this time of year, they must also consider whether an application of fertiliser is necessary. Apparently, the people at Opus One who are responsible for the health of this particular vineyard have decided that a good dose of potassium sulphate (K2SO4) is in order. I am assuming that it is K2SO4: potassium chloride (KCl) is another form of of potassium fertiliser that could be used, but it should not be used in a vineyard that may perhaps have an existing salinity condition. Late autumn or early winter is a good time to treat a vineyard as full advantage can be taken of winter rainfall to move the fertiliser down into the soil and on into the root zone. Seeing as this vineyard was ripped out last spring, perhaps due to some unnamed creepy crawly, this empty field is a clean slate on which a new and improved, and fertilised, vineyard can be planted. At only 22 Brix, but fantastic flavours (and lots of juice), our Syrah fruit was detached from their Mother Vines today - perhaps slightly prematurely. But, when one is faced with the prospect of more rain, and ever decreasing opportunities for photosynthesis, a Vinogirl has to do what a Vinogirl has to do. Or, something like that! The past two nights have seen the crew at Far Niente strip their vineyard bare of Chardonnay grapes...except for this one lonely cluster. Well, I'm sure there are more clusters abandoned deep within the rows and aisles of this vineyard, but I'm very particular about what items I anthropomorphise and this little, solitary, sad bunch of grapes is the item of my obsession right now. Anyway, I wish the winemakers at Far Niente a happy fermentation. Vinoland's Syrah is coming in tomorrow, whether it likes it or not. Harvest 2011 began in Vinoland today. The Pinot grigio juice (a respectable 23.2 °Brix) is now tucked up in the winery for the night. It is most likely resting and readying itself for an initial racking tomorrow that will separate the juice from the solids. We also brought in a tiny amount of Orange muscat. This is just fun stuff...the Cabernet franc is due to arrive on Thursday. Yay! It was a beautiful day to begin harvesting. With the temperature hovering around the 72 °F mark lunch on the deck, after a busy morning, of a modified Caprese salad and garlic bread was just what the Vinomaker ordered. To drink? Wine? Nah, beer! ...well, not quite. This row really undulates rather than winds, but looking down this row, in the Far Niente vineyard, I couldn't get one particular song out of my head. More often than not, Beatles songs are the soundtrack to my everyday life thanks to my sister, La Serenissima, who placed them in my head subliminally. Well, them or The Ramones actually, (thank you Thud). Anyway, yesterday the hard working folks at Far Niente stripped all the lower leaves off their Chardonnay vines in preparation for harvest...or just to let the clusters dry out from our recent four day rain event. Humph! Last year, the Far Niente Chardonnay was harvested on October 16th which happened to be the same day we picked Vinoland's Syrah. Fat chance of that this year! This Chardonnay must had it's vital statistics taken; it was tested for Brix, pH and nitrogen (YAN) levels and, after being inoculated with a commercial yeast, it is now enthusiastically frothing through fermentation. The barrels on the other side of the aisle with a different yeast selection are, by comparison, staidly going about their business. The Cross Evolution (CE) yeast being used, in this particular fermentation, is a hybrid yeast from a breeding programme at the Institute for Wine Biotechnology at the University of Stellenbosch in South Africa. Here in the US, at the winery where I am gainfully employed, CE is selected for it's ability to increase mouthfeel/texture and enhance varietal characteristics in Chardonnay. But, perhaps more importantly, CE is chosen because it is tolerant of high potential alcohol (up to 15%, important for Napa wine) and can withstand fermentation temperatures as low as 58°F (important for a non-ML Chardonnay). Vinomaker, unlike me, is quite a Chardonnay fan and was drooling, just as much as this bubbling barrel, at the thought of the finished 2011 wine. With it's tall Rhine-style bottle, Starbucks logo-like bronze medallion adorned label, single vineyard designation, and Vino-lock closure I approached my glass of Robert Sinskey's 2009 Abraxas with no preconceptions. 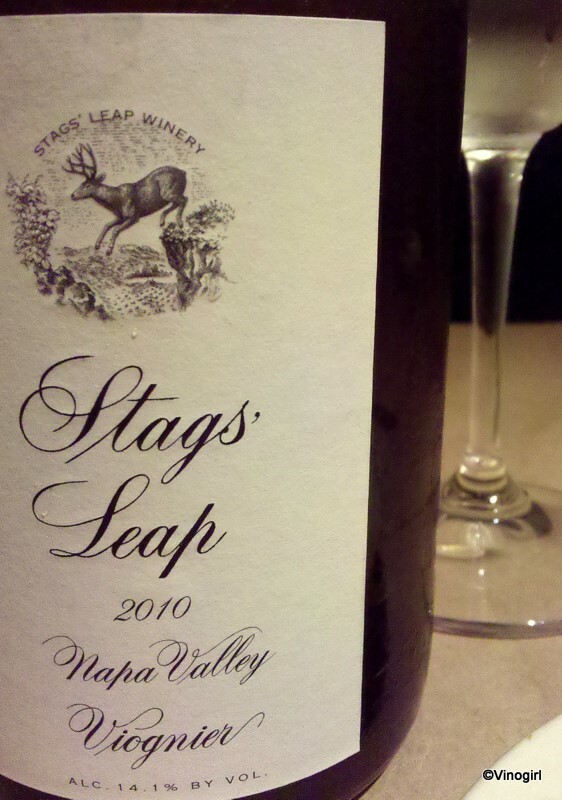 What I discovered was a wonderful grapefruity, floral, light to medium bodied wine with vibrant acidity. A blend of 43% Pinot Gris, 23% Riesling, 17% Gewurtztraminer, and 13% Pinot Blanc this Alsacesque wine was just the thing for a lazy Sunday evening. Vinodog 2 is four years old today, whoo hoo! V2 has really turned out to be a great dog; intelligent, quirky, cuddly, and very, very entertaining...she deserves a great birthday celebration. So, it's squeaky toys, biscuits and chews for her (and V1) and an adult beverage for myself and Vinomaker. Party on. Not so vile a zin. I really like Zinfandel. I generally find this particular wine varietal's combination of raspberries and pepper to be a winning one...that is when it is made well. Unfortunately, this evening's Zinfandel selection did not deliver the goods. It's not that the 2008 Turley, Duarte Zinfandel was horrible. It was pleasant enough, but it was slightly thin and, disappointingly, a little too oaky for me. Vinomaker and I acquired this bottle, and also one bottle of 2007 Turley, Cedarman Zinfandel, in a silent auction. Thankfully, we didn't pay that much for the two bottles. I'm hoping the second bottle is better than the first. The folks at Far Niente have not been letting the grass grow beneath their feet, in fact they disked said grass into their Coombsville vineyard's floor a couple of days ago. The FN vineyard crew also, whilst playing the waiting game with Mother Nature, made hay while the sun shined and drilled-in this coming winter's cover crop. The Chardonnay clusters are looking very nice right now, just a little bit of sunburn, but with more rain forecast for Tuesday and Wednesday who knows how long the fruit will stay looking this pretty. Waiting for harvest is not a total waste of time, there are a number of other vineyard operations for vineyard managers to busy themselves with whilst they wait, and wait, and wait. Sigh! So, last night in class I learned how to make sepia (and selenium) toned prints. 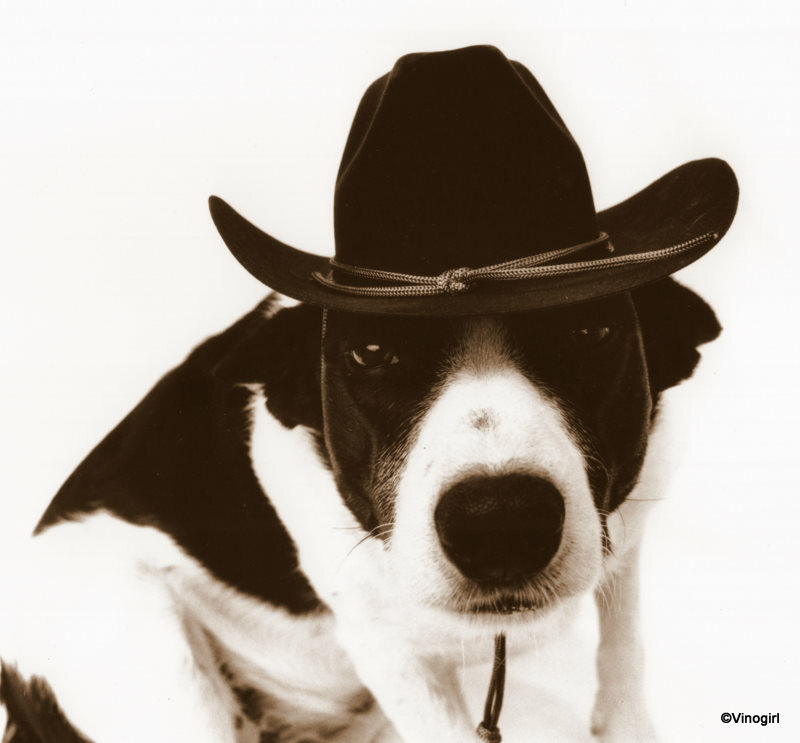 It just so happened that I was printing a vaguely Western themed photograph of Vinodog 2 and I thought it'd make a great candidate for my first attempt at sepia. Isn't she cute? Move over Wyatt Earp, there's a new cowdog in town! A wet spring, late budbreak, a cool summer, elevated powdery mildew pressure, senescence of the vines, and now a rather untimely autumn rain. Apparently, Mother Nature gave up drinking wine in 2011 without telling anybody about it, and now it seems that she has determined to not let anyone else even consider producing a vintage this year. The leaves of Vitis vinifera live for approximately 150 days: that's almost a full 5 months, from the time of budbreak, of basking in the warm California sun. The basal leaves, the first to appear in the spring, have done their very best for this vintage and are now amongst the first to slowly take their leave. See ya next year! The current assignment in my darkroom photography class calls for me to create a series of images that are inspired by a published photographer of my choosing. Whilst I would have liked to do a series of photographs of the Vinodogs, a la William Wegman, the reality is that my poor, arthritic Vinodog 1 can no longer be contorted into various poses just to satisfy my photographic aspirations. Instead, I have decided to create a portfolio of botanical images...starting with grapes of course. In an effort to do absolutely anything but my photography homework, I have decided to take a break and post a photograph of my favourite (for very obvious reasons) wine bottle-stopper. Thanks Thud! 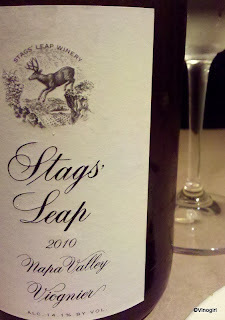 Without getting into a discussion about the placement of the apostrophe in Stags' Leap, versus Stag's Leap, I'm posting about a fabulous 2010 Viognier from Stags' Leap Winery, formerly owned by Carl Doumani who is known for having had a bit of a punctuation disagreement with Wayne Winiarski (of the 1976 Judgement of Paris tasting fame), who formerly owned Stag's Leap Wine Cellars (now owned by Tuscan producer Piero Antinori). Okay, I think I just gave myself a headache. I don't particularly care who owns the winery now, or indeed where whoever decides to put their particular apostrophe (although the California Supreme Court may care), I just love this wine. Redolent with the usual Viognier stone-fruity suspects and a big, blossomy nose, it is the ultra bright acidity in this Viognier that makes it a real winner. The finish just goes on and on. The wine retails for about $25 and it is well worth it. A fitting libation for California Wine Month. Lord Byron wrote: "...truth is always strange; stranger than fiction." Some things in life you just can't make up. And, some things are best left unsaid. Whilst chatting with an older couple (in the winery where I am gainfully employed), who were in the act of purchasing a 6L bottle of one of the finest Cabernet sauvignons in the Napa Valley, they shared a little too much information with me. "We are going to drink this wine at our wedding...and then save the bottle to use as an urn for our ashes." Yes! These folks were going to store their earthly remains, albeit incinerated, in a rather large antique-green Bordeaux bottle. I really didn't need to know that, definitely TMI. Very strange indeed.